News360 is throwing itself in the news aggregator game — again. 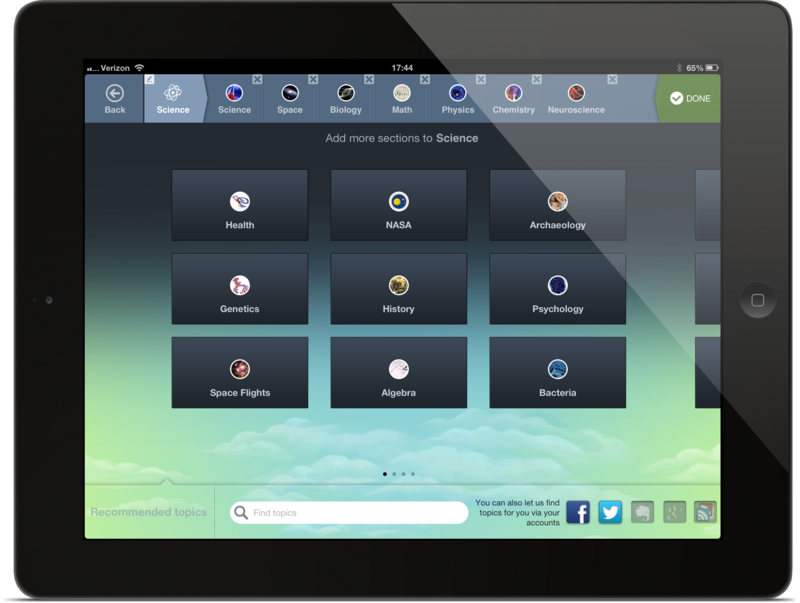 Today the app is unveiling its new iPad app, which features a cleaner user interface as well as one element that can help set it apart from news reader pack: favoring your personal preferences without relying on the “wisdom” of the masses. Since the likes of Flipboard hit the app store, various tools have debuted to solve our information overload problem by using social tools to evaluate what news is important to our circles while also taking stock of our preferences… and then, ultimately, pulling content from its approximately 40,000 sources-strong database. 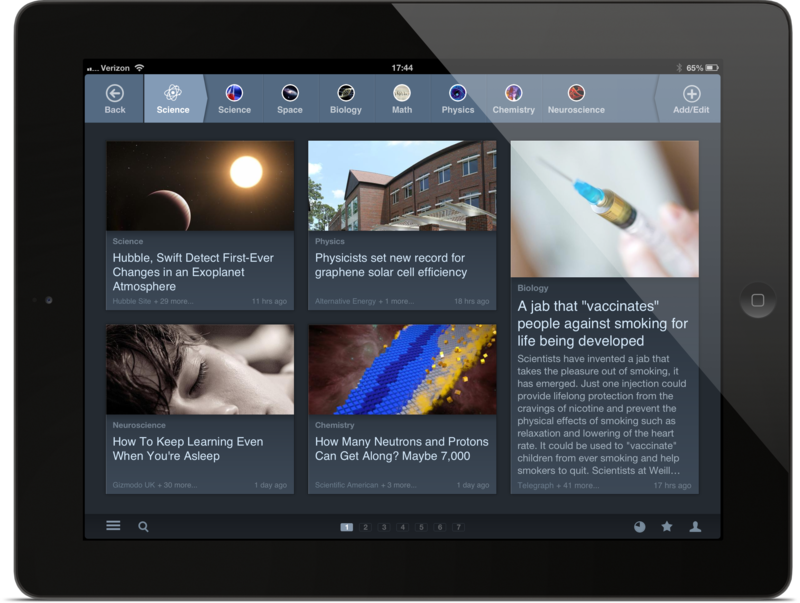 News360 also gives users an incredibly high degree of customization. Beyond picking publications and subjects you’re interested in, you can go deeper. Beyond indicating you like to read about science, you can also indicate you want to see stories about physics but not chemistry; robotics but not NASA. In a demo with Karachinsky, I got a glimpse at how thoroughly you can tailor your News360 experience — digging into the preference options available in the iPad app is like unwrapping the layers of an onion, you can just keep going. There’s also a Pandora-like mechanic to the application, so it will learn from you the more you use it and from the news stories you are reading, sharing, and liking — as well as those being discarded. As you might expect, News360 works with read-it-later apps like Instapaper and Pocket, which was available in the earlier iteration of the iPad app. Also making the return appearance are features like sharing and its language, tone, quality (and so on and so forth) reading algorithm that picks the best of the available news options for you. What might have been keeping you from trying out News360, however, was the UI. It wasn’t offensive or unintuitive per se, but it wasn’t exactly engaging. The new makeover is a much better match for everything under the hood. I would say it’s quite as sleek as Flipboard, but there’s also a lot more beneath the surface, so there’s your tradeoff. What News360 lacks in flash, it makes up for in utility. This is a news app that works; it’s methodical and highly customizable and it thankfully won’t spit out the news reader stories you see filling your Facebook News Feed. And again, just to clarify, the interface and design are nice — they just aren’t the app’s selling point. Karachinsky tells me that the changes made to the iPad app will hit other platforms in the near future as well, so your Web, iPhone, Android, Windows Phone, and Playbook (talk about compatibility) News360 apps will be getting the upgrade too.